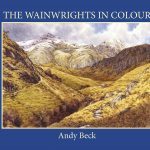 Summary: Great Crag features in the Central Fells book by Wainwright, and is part of the wider area known as Watendlath Fell. Located between the small hamlet of Watendlath to the east and Rosthwaite to the west the fell is a hill of multiple rocky tops which rise up through a cloak of heather. It may be of a surprise to some that Great Crag was not originally considered by AW when compiling his lists. Even though the fell and its near neighbour Knotts was named on the O.S. map of the day neither had a measured height but on the Bartholomew version Great Crag was not named whereas Knotts was named as (The Knot) and small contour lined encircled the top at a height of 1250′. This is most likely the reason that Knotts was included his first two lists over Grange Fell. Given that the expanse of land between Grange Fell (Brund Fell) to the north and Ullscarf to the south needed to be described and mapped in the Pictorial Guide is can be assumed that once on the ground Wainwright opted to include the higher Great Crag as a fell chapter over Knotts. 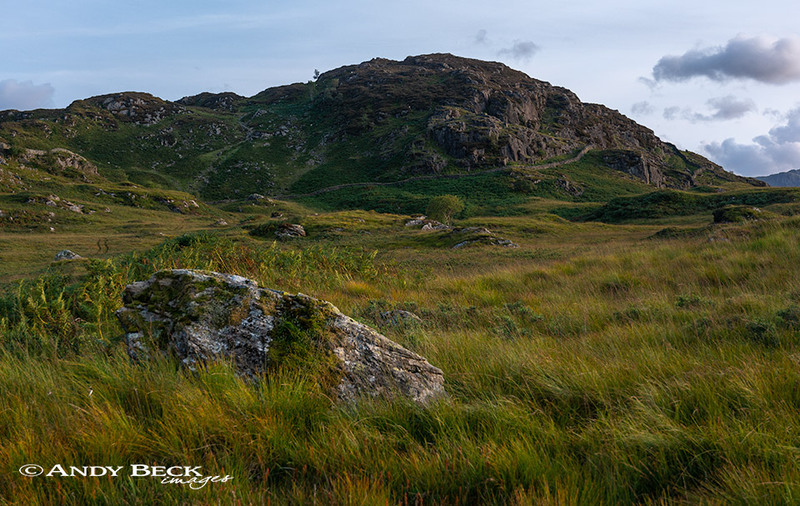 At 1473′ (1500′ approx AW) Great Crag has superior views over its adjoining top and the summit is a fine location to sit and take in the wider landscape. The fell can be ascended from either Watendlath, Rosthwaite or Stonethwaite, my preferred option being the latter as the route rises up though the mixed decidious woodland before reaching the open heather clad slopes of the summit area. There are no difficulties on this fell if the paths are followed. Topographical details: With no accurate information of height shown on his maps Wainwright estimated the summit as being 1500′. 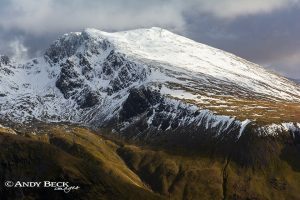 The height has now been calculated as 1473′ 449m as the highest point is where AW indicated at GR: NY27001 14685 so this is the Wainwright summit. 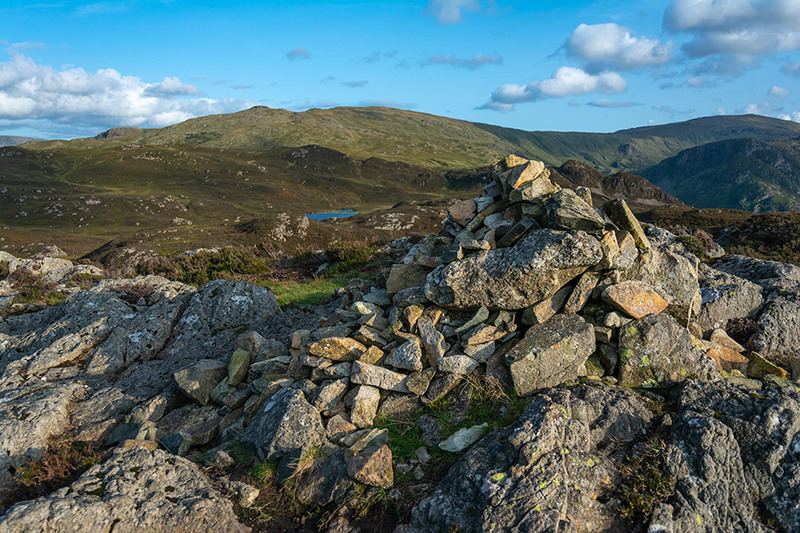 About 80m to the north on another rise is a single cairn (the two cairns shown here by AW have been reduced to just one) which is slightly lower and is the top on another fell list. If you stand on the Wainwright top and look north the lower cairn will be between you and the distant Skiddaw massif. Points of interest: There are no features such as mines or quarries on the fell. The views are good in most directions especailly towards Borrowdale and the Scafell range beyond. Dock tarn is quite large and is in a delightful setting with a small island which supports several young birch trees. Tarns: Dock Tarn to the east of the summit and a small unnamed tarn to the west between Great Crag and Knotts. Adjoining fells: Knotts lies just to the west, Ullscarf some distance to the south-east. Nearest facilites: Car parking in Watendlath, Stonethwaite and Rosthwaite. Tea room in Watendlath. Rosthwaite has The Flock Inn tearoom and The Scafell Hotel and The Royal Oak. Also The Langstrath Inn in Stonethwaite. Camping available near Rosthwaite and in Stonethwaite. Star rating: (2 / 5) Great Crag is an enjoyable fell for a short half day outing on its own orcan be combined with a visit to Grange Fell.